An Oakland police investigator measures the space between structures where a man fleeing officers died, Sunday, July 19, 2015. A man who died after becoming wedged between structures while fleeing from police officers during a traffic stop in the Lockwood Gardens area of East Oakland on Sunday evening was wanted for a $10,000 warrant, police said. Patrol officers stopped the solo male driver around 5:45 p.m. Sunday in the 1300 block of 65th Avenue, just off International Boulevard, as part of a traffic enforcement stop. About a minute later, the man fled on foot into nearby yards, according to police. The officers called for additional support before conducting a search and setting up a perimeter, police said. Communications officers advised the officers who were at the scene that the 23-year-old man, who was 6 feet tall and weighed about 190 pounds, was wanted for an active $10,000 warrant, according to police. In addition, officers found about a pound of marijuana in the man's car, police said. 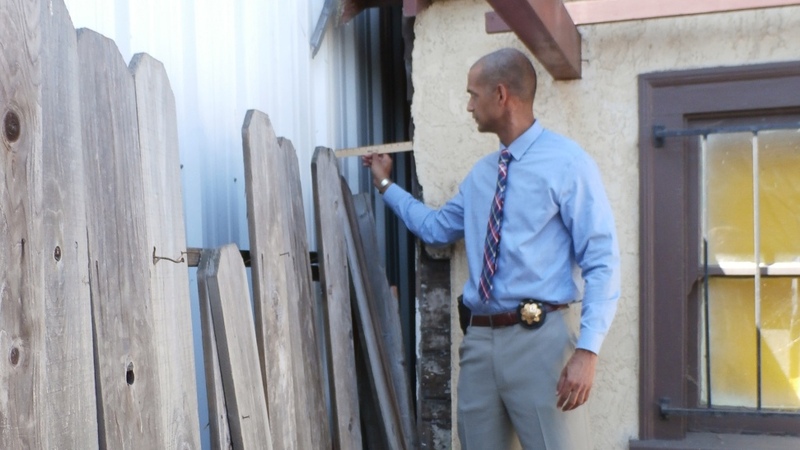 About a half-hour into the search, officers located the driver wedged into a small space between two structures in the 1600 block of 64th Avenue, according to police. Officers began CPR and called for an ambulance, but he was pronounced dead at the hospital. The suspect's name is being withheld pending notification of his family, police said. Police said officers didn't use force on the man at any time during the incident. The death is being investigated by police and the Alameda County coroner's bureau. Anyone with information about the case is asked to call (510) 238-3821 or the department's anonymous tip line at (510) 777-2805.